If you’re thinking it’s too good to be true to have your very own favourite beers on tap from the comfort of your own home, it’s not! With The Sub, you have the potential to transform your home into your favourite alehouse, for you, your friends and family. Everyone can enjoy a refreshing pint whether it be with friends or family, enjoy the best draught beers in your own home where you can host every party, watch every game and every film from your front room. Using one of our NetVoucherCodes discount codes could guarantee you extra savings when shopping at The Sub online to make your night in the extra bit enjoyable. You can get Heineken as well as Wild Lager, Amstel, Sol and so much more without having to spend a fortune at your local pub. The SUB Heineken is the signature sub and comes with some nifty features including a green light to indicate when the beer is cold enough so you’re sure to savour every single sip. You can complete your Sub Heineken experience with cool accessories like Heineken branded glasses and The Sub Skimmer to help lock in your favourite flavour. If you would much prefer pouring your own chilled pint of Heineken beer from your very own keg, The Sub Heineken is for you. As well as saving you money, The Sub Heineken boasts a stylish design, crafted using anodised and aluminium to give a premium, luxurious finish - one in which is bound to make a statement within your home. Simple load it up with your Heineken Torp and you’re good to go! 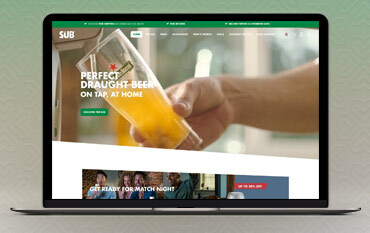 There is handy step-by-step guide online guiding you through the process of creating the perfect Heineken beer using your Sub. You don’t even have to have any bar experience using the Heineken Sub, you can find all the tricks of trade online from pouring to keeping it in perfect condition. Whether you opt for the Sub Heineken Edition or another edition, your home bar will be complete with your next Sub Purchase. Bring home the best of beer and shop a huge array of your favourite flavours and brands including Amstel, Sol, Desperados and many more. Simply purchase the Torp of you choice and find the Sub perfect for you and your home alehouse will be up and running in no time. You can choose from The Compact Edition, The Black, Grey or Rouge Edition and of course, the Heineken Edition. Each design is sleek, professional and stylish and guaranteed to pour the perfect pint. Shop the beer collection today and don’t hesitate to add one of our money-saving deals onto your order to guarantee you money off at the checkout. If you love a trip to the pub every now and again, with the help of The Sub, you can transform your home into your very own bar and enjoy the pub comforts from our very own living room! Whether it’s a cosy, movie night in, partying with friends or kicking back after a long day at work, enjoy a beer on tap for less in your own home! Shopping with a The Sub Discount Code can ensure you save money online too, so you can guarantee you’ll be paying much less for your Beer than you would down at your local. Choose from Heineken, Desperado, Birra Moretti and so much more, pour your own pints as much as you like with The Sub.